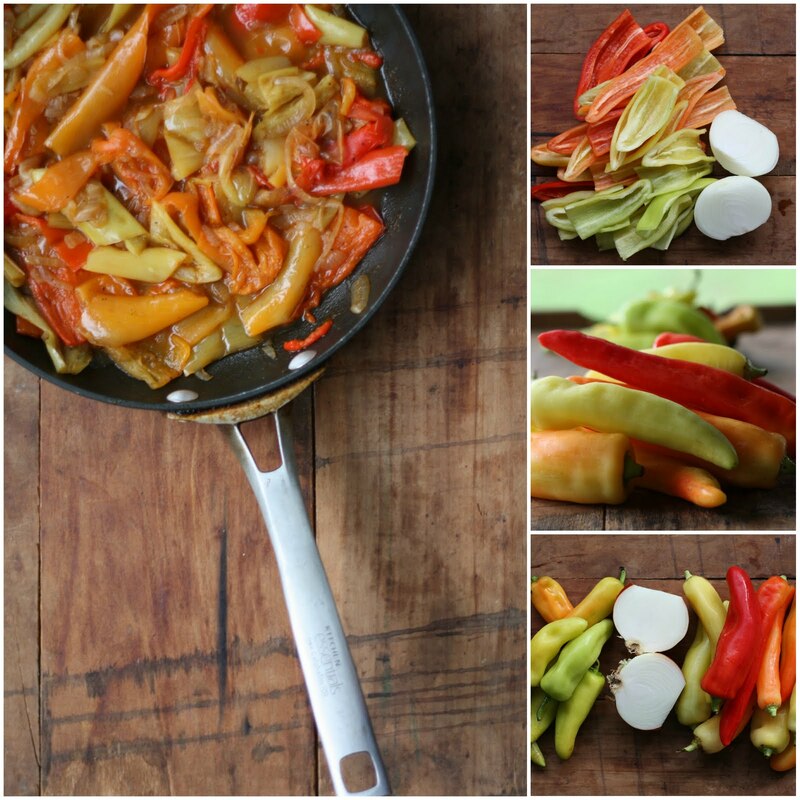 This wonderful Hungarian dish called Lecsó, pronounced "LETCH-oh" makes a simple meal for late harvest peppers. My father's grandmother always made this in late summer into the fall. My father has since carried on the tradition and this weekend I made my own variation of the dish which with minimal ingredients always amazes me how much flavor is produced. Saute onions over low heat for 8-10 minutes until soft and translucent. Pull from heat and add paprika to stir — careful not to burn the paprika when adding. Stir to coat. Onions should take on a red to dark orange color. Return to heat, add all pepper slices and cover on low until soft, about 15-20 minutes stirring occasionally. Peppers will create there own juice**. Add tomatoes, salt, sugar and cook covered stirring on occasion for 10-15 more minutes. Remove from heat, season with pepper and serve as a side dish or over eggs. ** Another variation at this point is to add 3/4 of a cup of rice and Hungarian sausage or kielbasi. Cook until rice is tender and serve as a stew. I promise the sweetness of the peppers and the hint of the spice will keep you searching for late harvest peppers. What dish do you remember growing up that carries some heritage in your family? Dzoli I had a feeling you would understand this dish! I am going to try with eggs. Thanks!